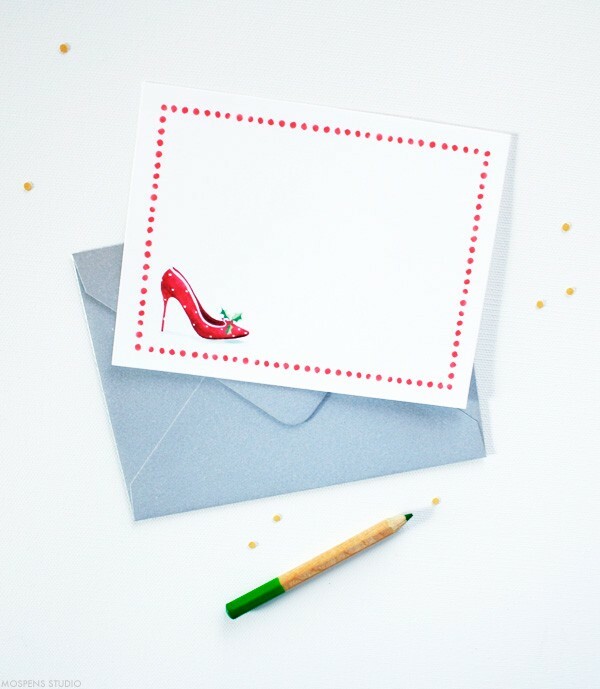 Happy Tuesday Shoesday and Happy New Year to you! Need a little pick-me-up after the holidays? This monogram giveaway may do the trick. A hand-painted watercolor monogram is the perfect way to personalize your note cards, cell phone wall paper, and more! Today I am giving away one custom monogram for your personal use. This is a digital file that you can customize all things YOU with. A value of $55.00. Winner gets: 1 digital watercolor monogram, Choice of 1 from the designs shown, Choice of one color. 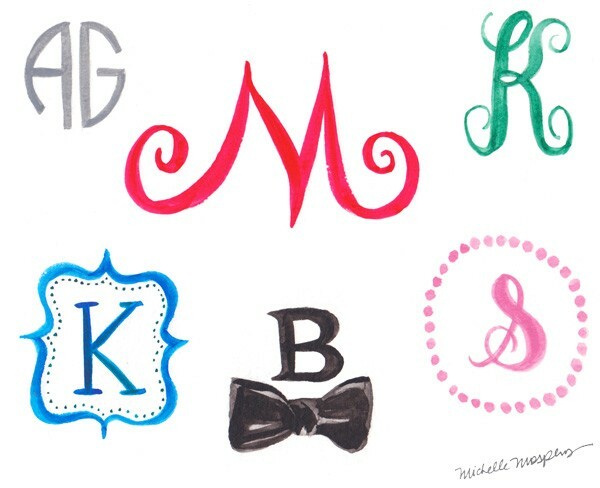 UPDATE: Kimberly won the custom illustrated monogram giveaway! Thank you to all who entered. Cheers! Clink! … At your reception, Signature Cocktails are another fun way to share your personality with your guests. Then while browsing Anthropologie’s blog I spotted IT’S 5-O’CLOCK SOMEWHERE posts. And then found FRIDAY HAPPY HOUR at Oh So Beautiful Paper. There are so many great ideas to be had out there. In a large pitcher combine white wine, peaches, sugar (if desired) and peach vodka. Chill for 3 hours or until cold. When ready to serve, pour in peach flavored sparkling wine and stir gently. Disclaimer: Mix your ingredients and give the recipe a try before your event to ensure it is to your liking. Feel free to change to match your taste, of course. Drink Responsibly. 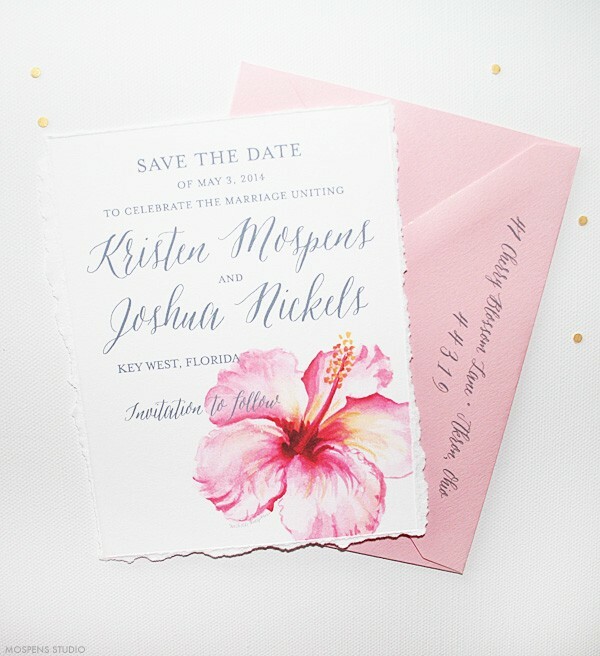 Today, I am in LOVEEE with this Florida beach wedding invitations and wedding stationery suite. If your wedding is on the lawn by the sea or on the beach under a palm tree, you will love this beach chic design too! 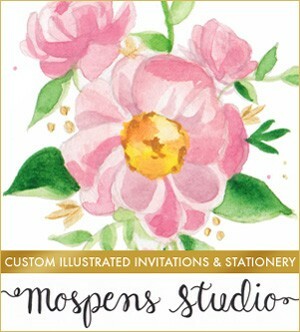 This first wedding invitation design is a TRUE Signature favorite at Mospens Studio. The best part? Your guests have an art print to keep as a momento! 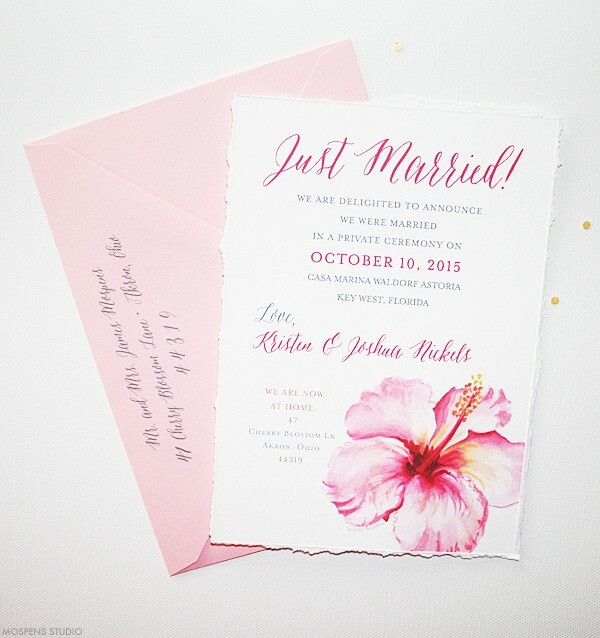 The vellum overlay is printed with your text, the card printed with just the Hawaiian hibiscus. The overlay is loose and easily is removed once the ribbon is untied. As I was preparing these samples for a bride-to-be, I found myself designing more and more pieces to match! Attach matching WELCOME! 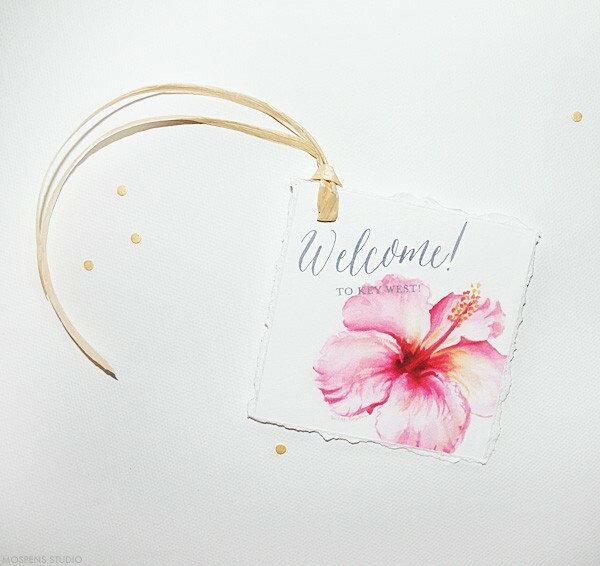 tags to your guests’ Welcome Bags. Too cute. 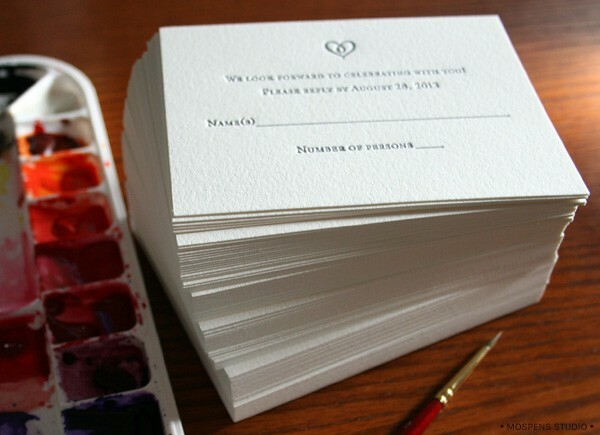 Last but not least … Mail your wedding announcements the day of your wedding or a tiny bit after. You can have them addressed, sealed and ready to go, then have a friend or relative drop them in the mailbox for you. Be sure to include your “at home” address for those who did not attend your wedding and who would love to send you a gift! The samples were originally created for a bride-to-be’s wedding in Key West Florida. 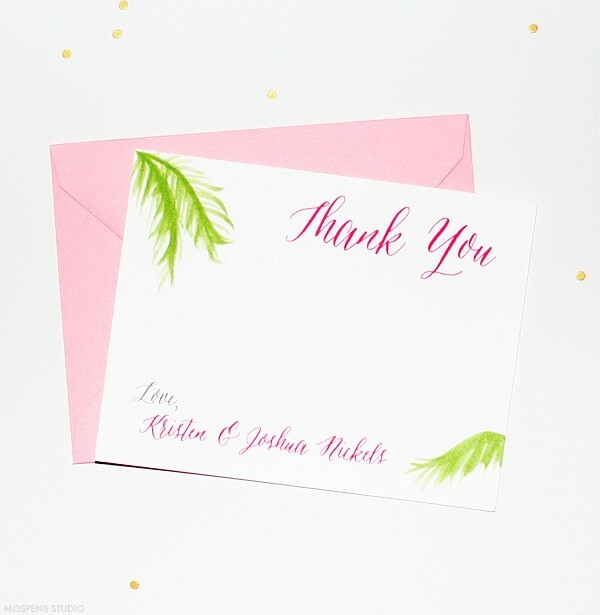 This SIGNATURE design can be customized to match your wedding color scheme and theme. Contact me directly for details. Happy Friday to you! CHEERS! It’s the most wonderful time of the year!! And it is a great time to introduce Tuesday Shoesday at Mospens Studio. 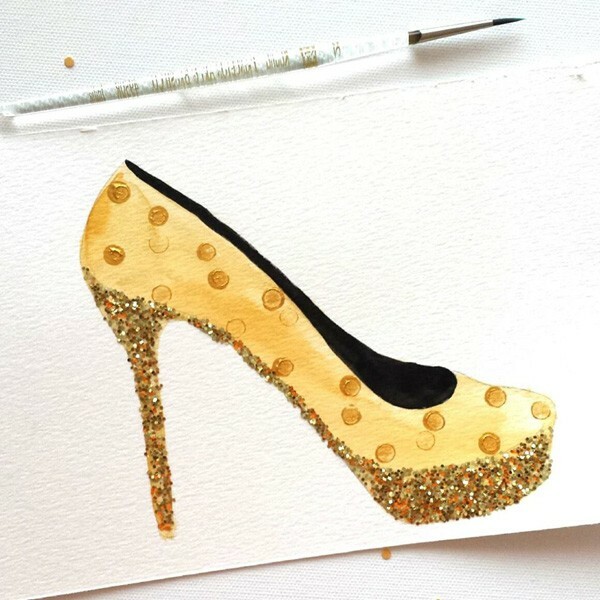 Each Tuesday I will paint a NEW high heel, flip flop, or shoe artwork and feature here. 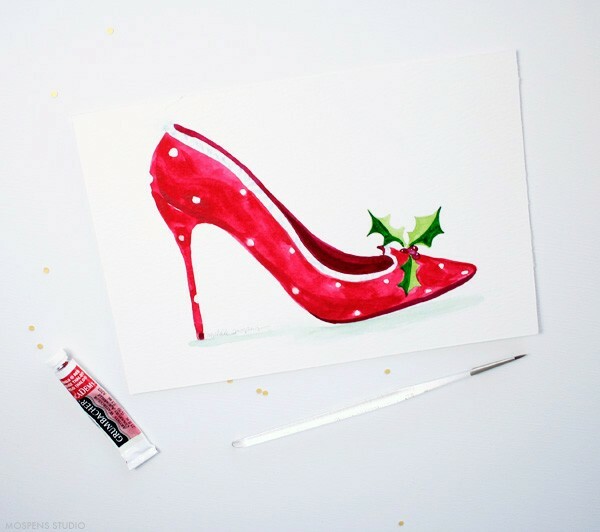 Today is Christmas Eve and I wanted to design and paint a fun HOLLY JOLLY high heel for you. Sleek design, with polka-dots of course, and fluffy faux fur trim. Adorned with holly leaves and berries. After I painted the art, I just had to design note cards. Too much fun! Happy Christmas Eve to you! 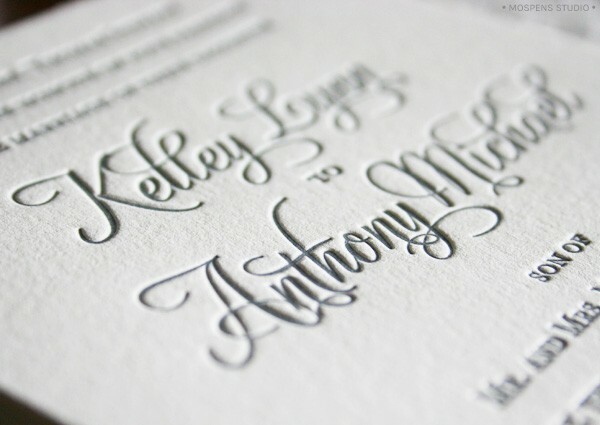 I have to admit, I am head over heels in love with Kelley and Anthony’s custom wedding invitation. Hand-painted sweet and simple hearts in the lightest pink watercolor paint. EACH 100% cotton card was hand-painted by hand. Letterpress just makes me happy. 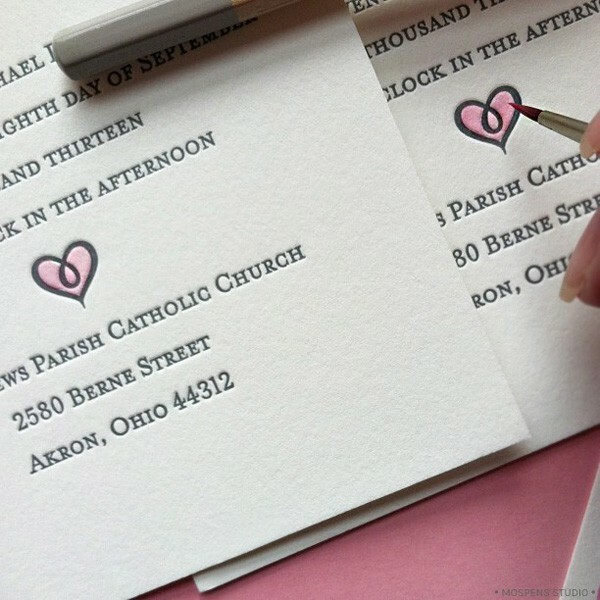 The printing technique is impressed (called a kisss) into soft cotton invitations. 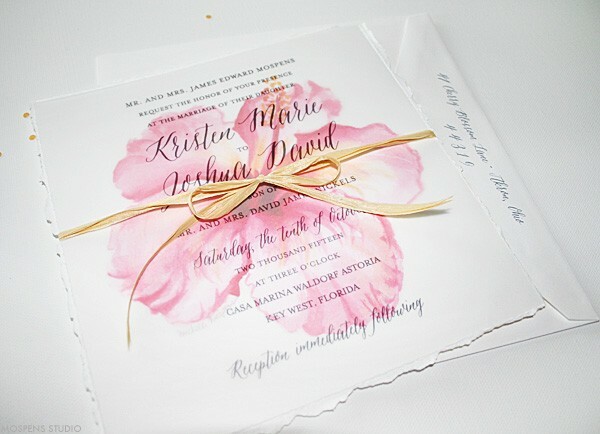 Beautiful and instantly adds luxury to all invitation designs. At Mospens Studio, James and I do prefer a deep kiss … for our letterpress printing. The texture of cotton is gorgeous. 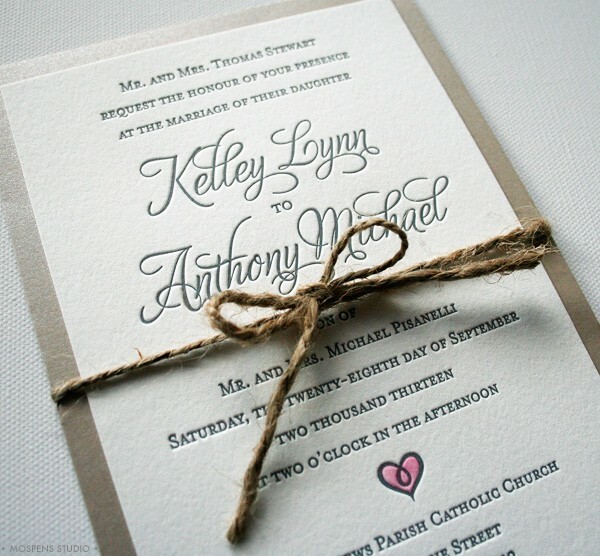 Kelley hand-tied each rustic wedding invitation with twine. This design is truly romantic with a rustic twist. 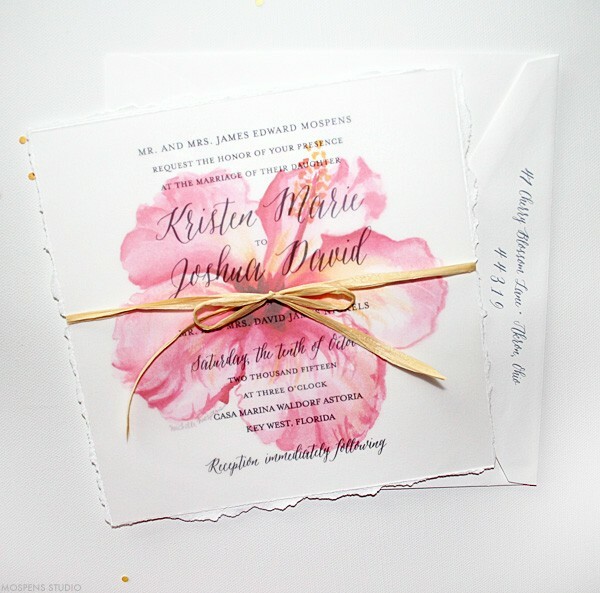 Soft pink and gray wedding colors were carried through perfectly with their wedding invitations. 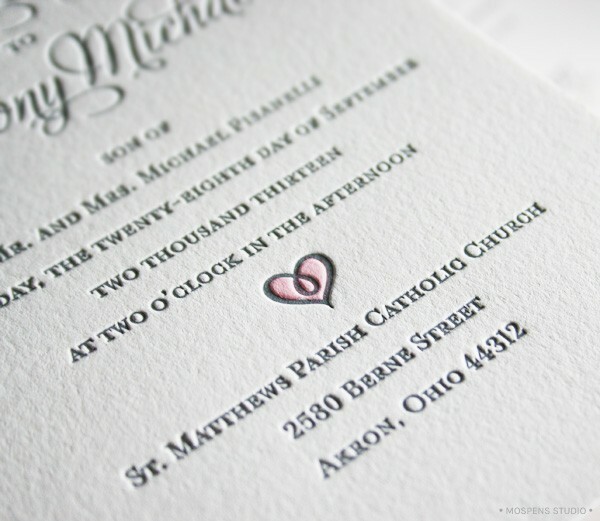 The pearl white tree free cardstock is luxurious and soft to the touch. Hundreds of painted watercolor hearts drying. Next they were assembled by hand and attached to beautiful tan rustic metallic cardstock. Perfect for a vintage wedding with a modern country-chic twist! I’m delighted to say I am have been designing a beautiful country-chic rustic wedding invitations collection! I can not wait to share. 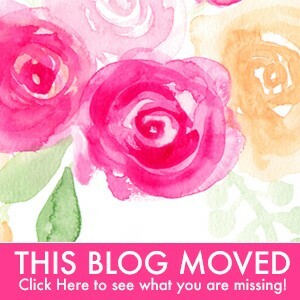 Keep an eye on my blog for updates!! 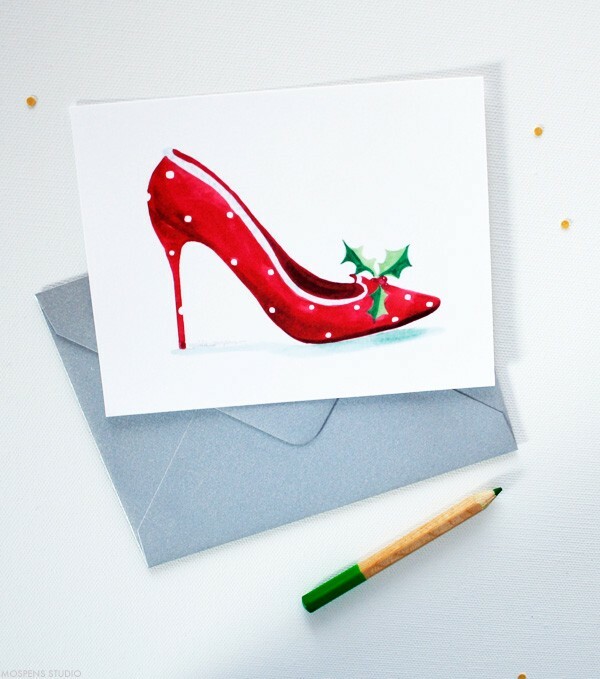 As the holidays approach, one card on your personal gift list should be chic and unique Thank You Cards. And boy do we have just the creative, fun, and colorful designs for you. 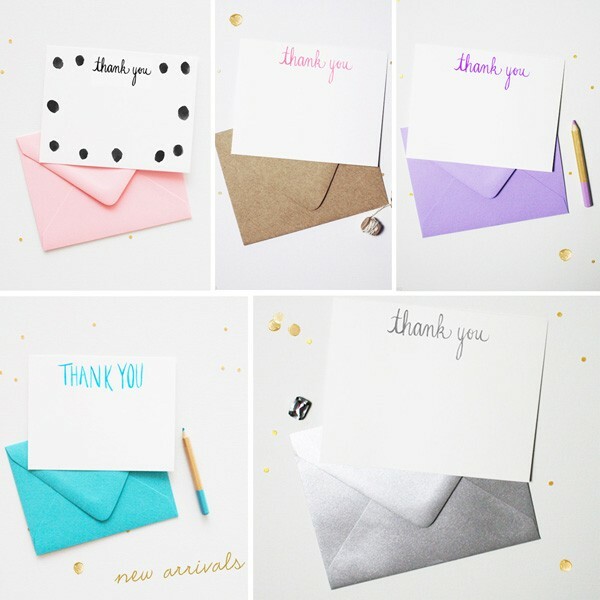 Introducing 16 ways to say THANK YOU. Hand-painted lettering and bright colors will certainly get the job done. 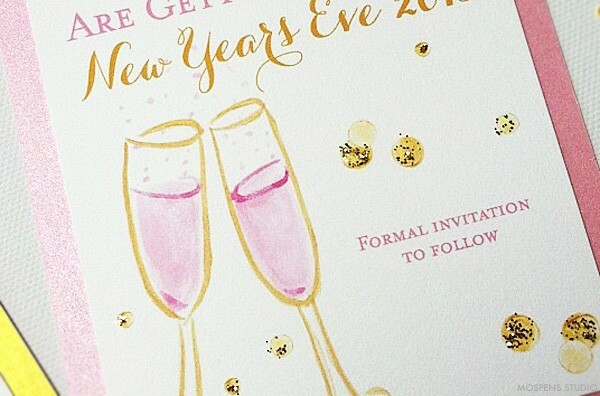 Hand-painted gold glitter New Year’s Eve Wedding Save the Dates? Yes, please! Cue the confetti! Our unique save the dates are fun, sparkly, and creative. 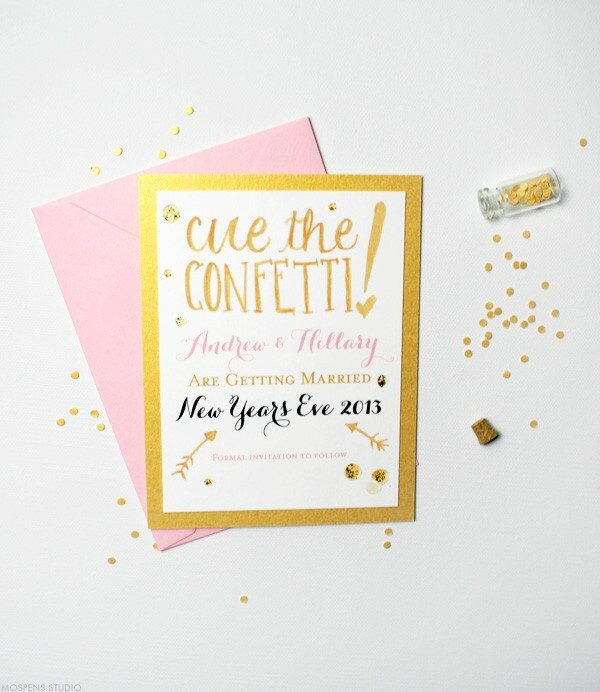 Watercolor glasses clinking and gold confetti sparkling make our unique save the dates perfect for your New Year’s Eve wedding. 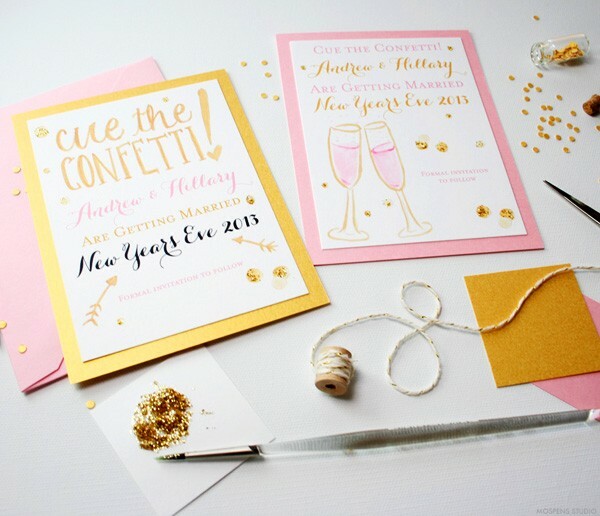 Shown here in pink metallic, gold metallic, and white cards. 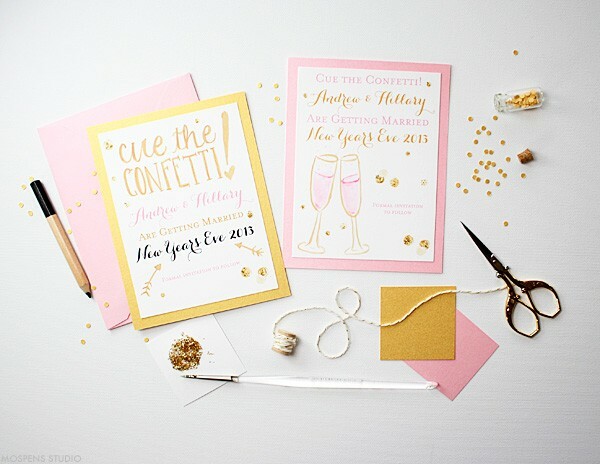 Of course you can customize our unique save the dates in almost any color to match your wedding color scheme. Each wedding save the date card is handmade and personalized just for you. 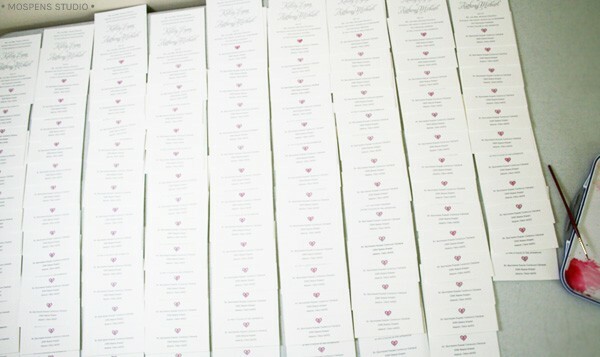 Pink or white envelopes shown, many colors available. 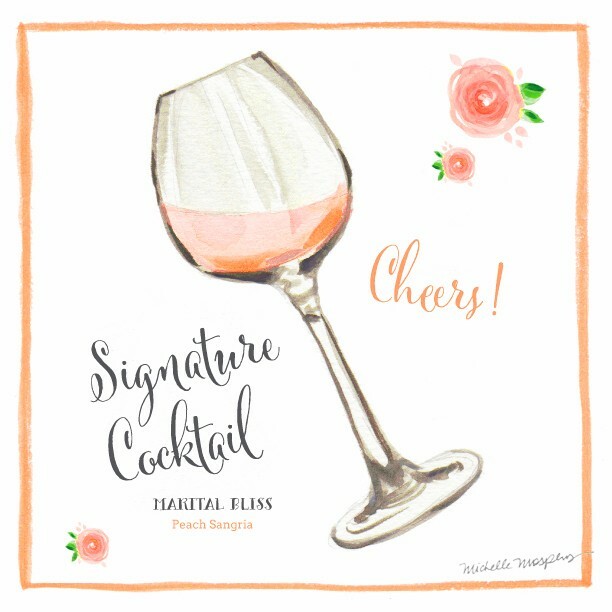 CHEERS to our fun watercolor hand-painted champagne glasses illustration. Perfect for your New Year’s Eve wedding, party, or event! Remember, to mail out save the dates 6-12 months before your wedding day. Especially if your BIG day is on a holiday. 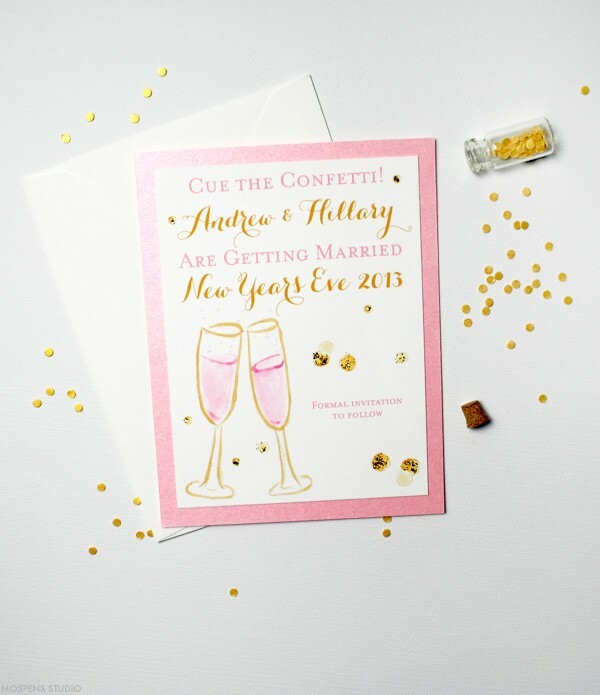 Shop our save the date wedding collection or have a custom save the date created just for YOU!